R. Armitage as Bard, 2008. Here’s a small painting I did back in 2008, thinking that it would be great if Richard Armitage got a part in The Hobbit. Along with many other fans, I thought he’d make a wonderful Bard. As we now know, Richard did get a part in the movie – a much bigger part, of course – but I haven’t painted him as Thorin; not yet anyway! Anyway, I hope that some of you – especially RA fans who didn’t already see it six years ago – might be interested in having a look. With apologies to Luke Evans! Acrylic paints on 13 x 18cm watercolour paper, 2008. Finished painting, above, scanned into PS CS5 to highlight the windows and roof trusses of the buildings, and add contrast. Bard sketch based on Guy of Gisborne. The song-thrush looked like a budgie at first. Background buildings are sketched in. I was quite happy with the reflections. Shiny trousers, suspiciously like Sir Guy’s. Still mucking about with the hair. This is a water-soluble graphite painting I did back in 2008, just for fun; starring Guy of Gisborne as an unmasked black rider. I could only fit three of the hobbits on the paper. Sorry about that, Merry. Sam and Frodo at the End of All Things. ROTK, LOTR. This is quite a large painting, as you can probably see from the progress photo in which it’s leaning against a chair. I think that I didn’t ever finish this one. Must go and drag it out of the shed and complete it at some stage. Acrylic paints on a stretched canvas. 2005. Frodo and the Ring, The Two Towers. The Ring gradually overpowers Frodo, TTT. Acrylic paints on canvas board. Leaving Lothlorien, Fellowship of the Ring. Leaving Lothlorien. Acrylic paints on 35cm x 65cm (approx) stretched canvas, 2006. Click on this picture of Leaving Lothlorien to open it; then right click and save it to your computer if you’d like to print yourself one copy. Deeply Cloven Track. 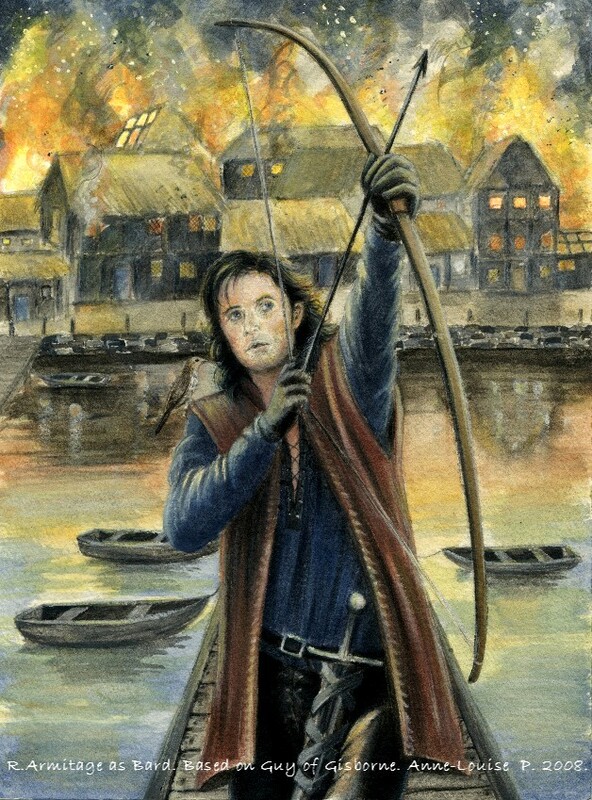 LOTR ACEO miniature art card. 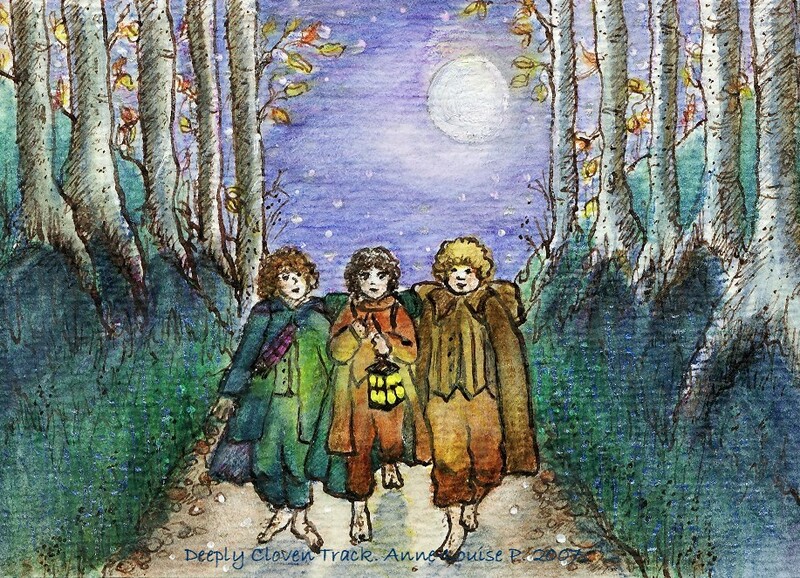 Frodo, Sam and Pippin leave Hobbiton in the middle of the night. 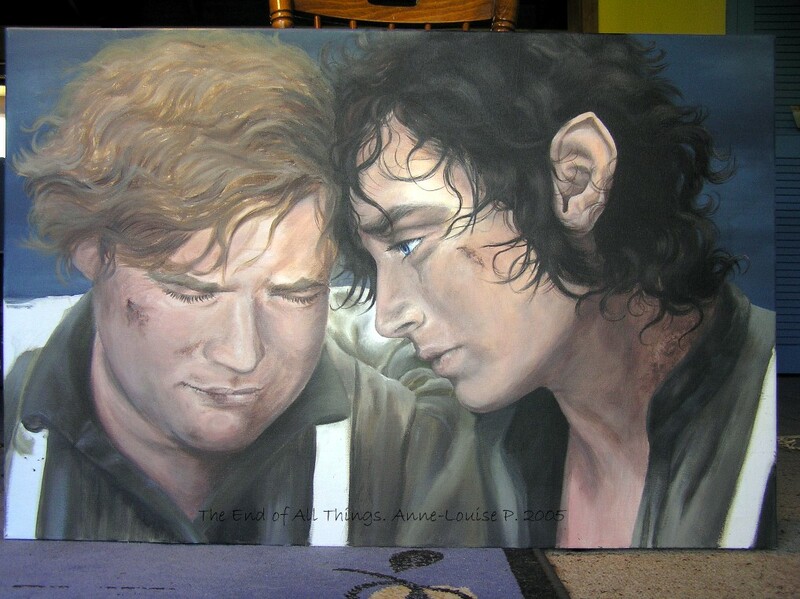 This painting is based on a scene from the book of The Fellowship of the Ring, using the appearances of the characters from the film in caricature form. Pen & ink and watercolour pencils on 9 x 6 cm (3.5 x 2.5 inches) paper, 2007. 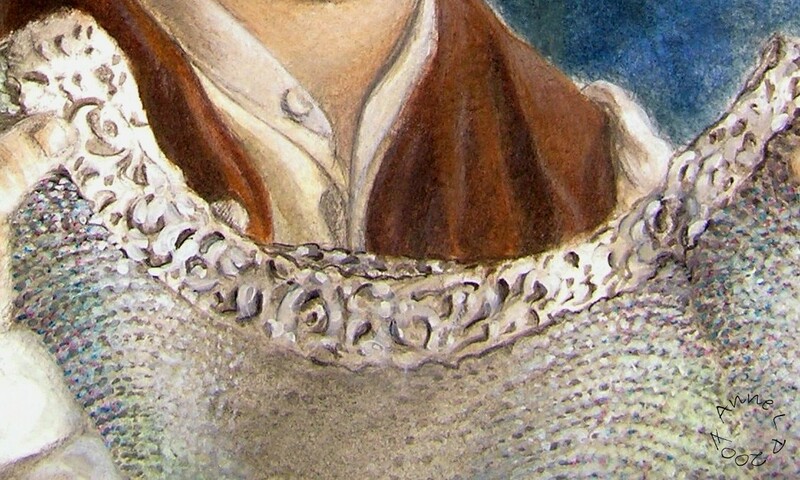 Two versions of Frodo with Bilbo’s Mithril Shirt. The first version is based on the original mithril shirt scene from Fellowship. 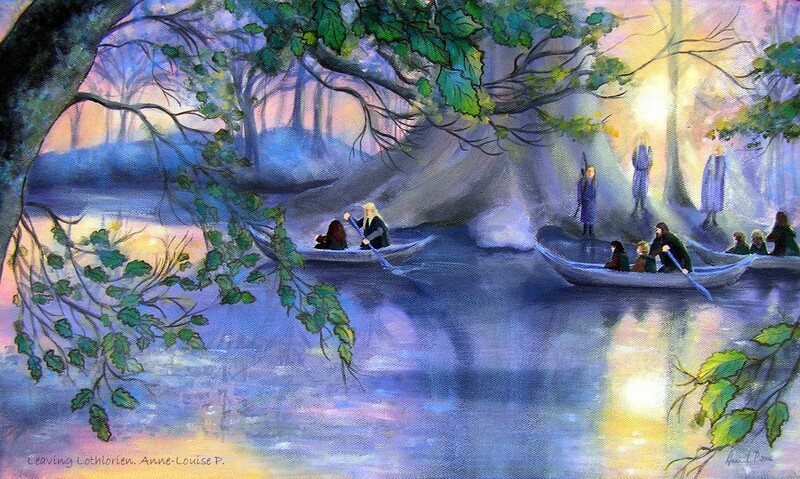 The second has a Rivendell exterior landscape in the background, as requested by an American lady in 2007. Acrylic paints on 25 x 20 cm watercolour paper. Sam & Frodo Watch the Elves. 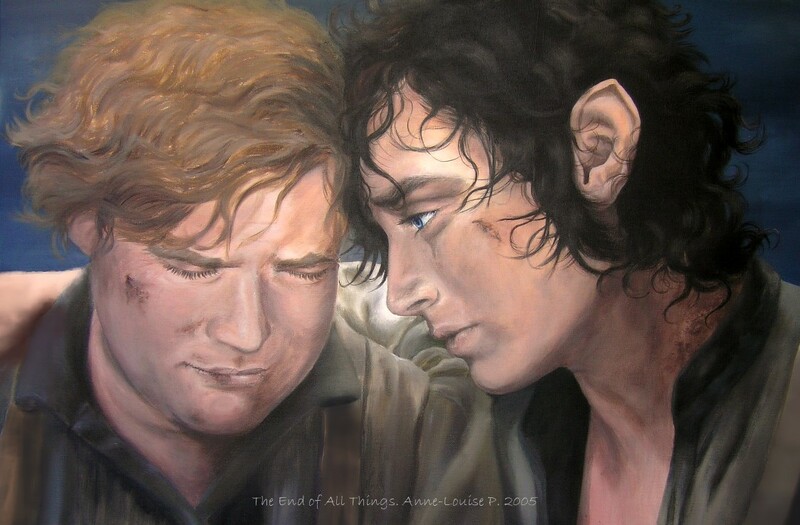 I did this painting of Frodo and Sam back in 2006. They’re watching in awe as the Elves pass through the woods on their way to other lands. Acrylic paints on canvas board, 25 x 20 cm, 10 x 8 inches. Gandalf, Frodo and Sam leave their village at dawn. Acrylic paint on a 30 x 40 cm stretched canvas, 2006. First photo was taken while paint was still a bit wet and in artificial light. Second was photo taken in natural light when it had dried completely. 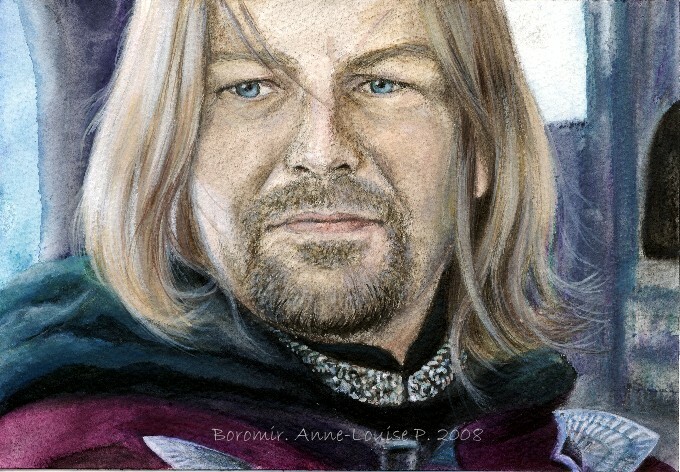 Everyone Needs a Bit of Boromir Now and Then, Part Two. Boromir heads off to Rivendell. Graphite pencil, watercolour pencils, acrylic paints on 18 x 13 cm watercolour paper. 2008. Our oak tree in winter. June 2015. Richard Armitage as John Thornton. More autumn trees in my garden. May 2015. Autumnal trees in my back yard. April 2015.